Guilt free pizza? Yes please! 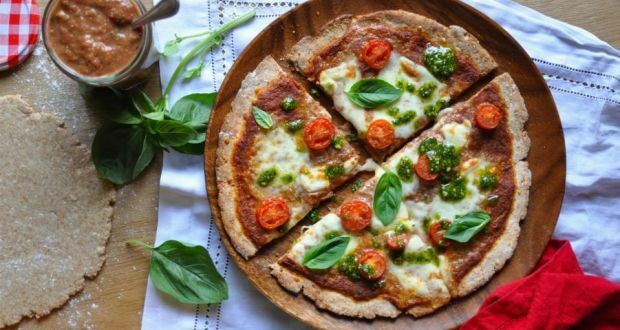 Homemade pizza definitely makes for a healthier alternative to the traditional pizzeria versions that are typically loaded with fatty toppings and very salty sauces. This recipe from Lilly Higgin’s weekly column in The Irish Times used our Milled Chia Seed makes for a much healthier alternative with no nasty ingredients and an added boost of Omega 3 goodness from our milled chia seed. If you are lactose free or vegan you could try out Violife’s range of vegan cheeses to adapt this recipe. 1. Place the yeast and sugar into the warm water. Stir and leave for five minutes. 2. Place the flours, ½ tsp salt and parmesan into the bowl of a food processor. Blitz to combine. Add the frothy yeast water and blitz again till a rough dough forms. Tip the dough onto a lightly floured surface and gently knead till it comes together to form a smooth dough. Set aside and cover. 3. To make the sauce place the chopped tomatoes, garlic, herbs and ground chia into the bowl of the food processor. Blitz till it forms a lightly textured sauce. Add salt, black pepper and a dash of something sweet to balance the tomatoes. 4. Roll the dough out as thinly as possible. Lay the dough onto two lightly floured trays and spread a few tbsp of sauce onto each one. Divide the mozzarella between the pizzas. Bake for 12-15 minutes till the mozzarella is bubbling and the crust is golden. Remove from the oven and drizzle with pesto or olive oil and fresh basil before serving. Happy Customer ... 28 delicious bars delivered to the door. Easy website to navigate, order arrived in a couple of days, very reasonable delivery charge. Getting the simple things right. More importantly the Chiabar is a really good product. The kids love them in their lunches and I'm delighted they are choosing this healthy option in the face of all the competition. Keep up the good work, I'll be back for more. Having bought from this company before and being very happy with everything, I'm back ordering more seeds and bars. Get notified of the best deals on our products.